Asus has unveiled a new version of the GeForce GTX 950 that reduces the power consumption of the card from 90W to 75W, which allows it to run purely from motherboard power and without any 6-pin PCIe power connectors. Even though this new GTX 950 has a 15W lower TDP than the standard reference card, it appears to include the same GM206 GPU with near-identical clock speeds. As noted by AnandTech, this should mean that the 75W GTX 950 will perform around the same level as the existing 90W variant. The Asus GTX950-2G, as it's known, features core clock speeds of 1026 MHz with a boost clock of 1190 MHz: just 2 MHz faster than the reference GTX 950 clocks. There is also an OC mode that pushes the base and boost clocks up to 1051 and 1228 MHz respectively, providing a small improvement in performance, although the low TDP may limit further overclocking. 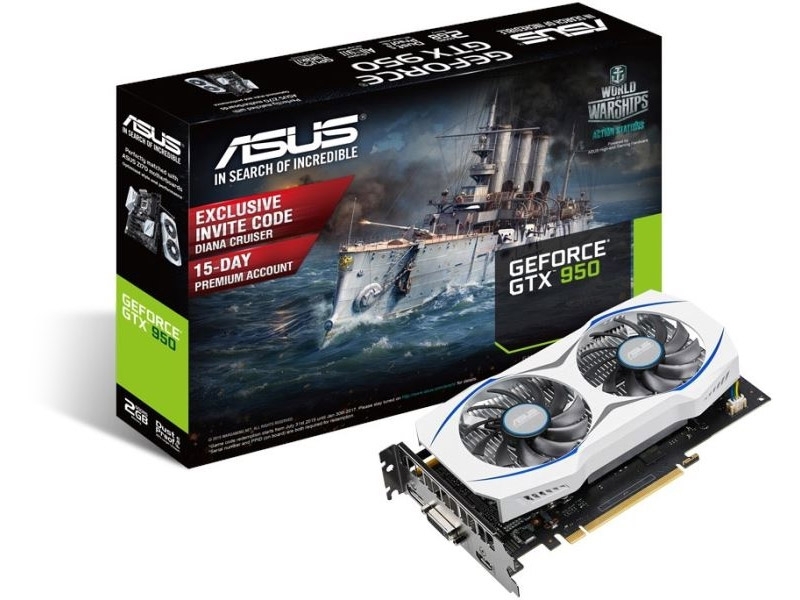 Aside from the minor modification in clock speeds, Asus' new GTX 950 provides a similar feature set. There's 768 CUDA cores with 48 texture units and 32 ROPs, and 2 GB of GDDR5 frame buffer at 6.6 Gbps. The cooling solution uses two fans and an aluminium heatsink, and you're getting DisplayPort, HDMI 2.0, and DVI connectors on the I/O shield. The GTX950-2G hasn't appeared in retail channels yet, so there's no word on how much the card will cost. However, other GTX 950s currently sell for around $150-170, so we expect the 75W variant will also fall in this price range. Can't wait for the next generation of even more efficient cards, maybe the 1180 will be sans cables as well. Hardly surprising. The 950 is the 9xx version of the 750, which also required no external power. This isnt even close to true. A key advantage the GTX 950 has over its AMD competitor is superior overclocking. I can't imagine the same 20%+ headroom will be offered by this lower powered version. Haha, what?! 950 is a "deffective" 960, end of discussion. FYI: 750 and 750 Ti were a chip completely apart from the 760; so... not the case here. That was one advantage, but only one. I think the increase in efficiency trumps that though. I think he just meant it was designed to compete in the same market segment, rather than imply that it's a simple re-badge. Ziffel, Drew Valadez and cliffordcooley like this. This is very good for htpc. I will wait to see pascal specs before considering this. Low quality motherboards are likely to fry when this GPU draws nearly 75W continuously from PCI Express slot. That 75W must come somewhere and PCI Express power connector is much better way to supply it than 20/24 pin ATX connector. Low quality motherboards are likely to fry when this GPU draws nearly 75W continuously from PCI Express slot. In a system with 3 or more PCIe card slots, the motherboard better be able to handle one card with a 75W power requirement. I didn't say 3 PCIe x16 card slots. The number of channels a card slot has doesn't dictate the power requirement. The motherboard must be able to provide max power for all card slots. If it doesn't it is underrated. Even MicroATX usually has 3 PCIe slots. That's support for over 200Ws, which I'm sure is plenty for a 75W card. A standard height x1 add-in card intended for desktop applications is limited in length to a half-length add-in card and 10 W maximum power dissipation. Thank you for proving me wrong, you were even able to do it without all the BS. Duckeenie and HardReset like this. An x16 slot has to be able to provide 75 watts to be considered standard compliant. If the board has an x 16 slot, it will provide sufficient current for the card. It will use both 12v and 3v rails. If you are worried, use a gigabyte ud board, they use thicker traces. Or just don't buy this version of the card? If your worried about it drawing too much current directly from your wimpy motherboard just buy the one with the 6 pin power connector. Not only will you not have to worry about frying anything, but you also get the additional headroom from the 6 pin to overclock the card. Really unless your PSU doesn't have a 6 pin, you shouldn't be considering this card, at least I wouldn't. Or just don't build computers at all, that'll work too. Rather than buy a low end card and motherboard for over clocking, buy the next card up and run it at the stock speeds, or buy gear that's overclockable. Either way is less risk and will increase the lifespan. So I thought I read somewhere this card has twice the performance of the GTX 750Ti it is intended to replace? Is this true? I will be purchasing one for my new server. Does a server need to display graphics and render video a lot to warrant a dedicated gpu? It will also serve as a secondary light gaming machine for when friends come over and need a machine. Its there so might as well use it when needed (Which happens quite alot). That's exactly what I meant. It amazes me that this needs to be explained.